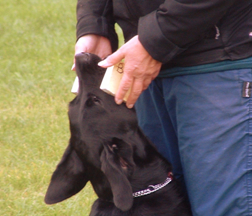 'Obedience' is the all-encompassing word to describe dog training at whatever level you choose. Obedience is a very big part of everyday living with your dog and there can be few more pleasurable activities than 'showing off ' a well-trained dog. There is an undeniable inner sense of satisfaction (and smugness) when, for example, on a trip to the Vet, your dog steps very calmly onto the scales, stands perfectly still to be weighed, and then you watch other clients having a real fight with their dogs and it takes the owner and two veterinary assistants five minutes to weigh the 'hound from hell'. Obedience as a competitive sport has been around since the early 1950's. The sport tests the ability of the dog (and handler) to perform set exercises such as walking to heel both on and off lead, recall and stays which are the basic exercises and retrieve, sendaway, distance control and scent discrimination which are more advanced. All of these become more difficult the higher one progresses. Like any other sport it requires training and if you aspire to get to the top of the sport you need to have the time to train and the willingness to put in the effort. The other essential, of course, is a dog, do not be put off because your chosen breed is not a collie type, any breed of dog can do obedience, it is only a matter of the correct training and a bit of perseverance. The best way to start in obedience is to join an Obedience Training Club most of whom will run short courses designed to give you the basics and if you find that you and your dog are enjoying it and more importantly showing a willingness to learn you will very likely find yourself invited to join the club on a more permanent basis. There is another avenue into Obedience and that is via the 'Pet Obedience Club' or one which trains for the Kennel Club Good Citizen Dog Scheme. Full details of this scheme can be found on the Kennel Club website at http://www.thekennelclub.org.uk/dogtraining. It is best at this stage to confine yourself to these lower level shows till you and your dog gain a bit of confidence, as it can be very nerve racking once you start to move up to the higher levels. The Scottish Kennel Club has its own Beginners Competition which is only open to dogs and handlers resident in Scotland who have never before participated in an Open or Championship Obedience Show at Beginner level or above and is a good entry level competition. Do not rush to enter Open Obedience Competition even though you may think you and your dog are ready - it is a big step up from pet obedience. When you have decided you are ready for Open Obedience what should you do? First get yourself a copy of the current Obedience Regulations (from the KC or SKC ) and read them thoroughly, these contain all the details of the classes you can enter and the required tests for each class. Next find out which shows are on and when and where they are being held. 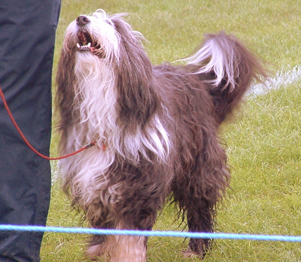 You can do this by obtaining a Show Diary from SKC or via the internet at the Obedience UK website at http://www.obedienceuk.net Go visit one or two of these shows (without your dog) and have a good look around just to see what would be expected of you. All Limited, Open and Championship Shows have a closing date for entries which is generally 4 - 6 weeks before the date of the show and your entry must be received on or before the closing date. Decide which class or classes you are going to enter, bearing in mind that in Obedience you must enter the lowest scheduled class for which you are eligible and you may enter one (or two further classes, if the organising society permits this), there are some exceptions to this rule and these will be detailed in the show schedule, complete the entry form and send it, along with your entry fee, to the appropriate person named in the schedule. Go to the show on the appointed day and enjoy yourself - that, after all, is what it is about! This competition is held annually with registered clubs holding heats of the competition between March and July. Entry is restricted to dogs and handlers resident in Scotland who have never before participated in an Open or Championship Obedience Show at Beginner level or above. The Competition is organised on a heat basis and the first four places in each class will qualify for the final, held in conjunction with the SKC August Championship Breed Show. Adults. Further details can be obtained from the SKC Office or direct from the heat organisers. Heelwork on Lead - This dog should be sitting straight at the handler's left side. On command the handler should walk briskly forward in a straight line with the dog approximately level with and reasonably close to the handler's leg at all times when the handler is walking. The lead must be slack at all times. On command "left turn" or "right turn" the handler should turn smartly at a right angle in the appropriate direction and the dog should keep its position at the handler's side. 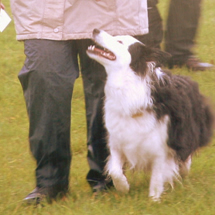 At the command "about turn" the handler should turn about smartly on the spot to the right and walk in the opposite direction, the dog maintaining its position at the handler's side. On the command "HALT" the handler should halt immediately the dog should sit straight at the handler's left side. Throughout this test the handler may not touch the dog or make use of the lead without penalty. Handlers may talk to their dog and encourage them throughout this test. Heelwork off Lead - Carried out in a similar manner as for Heelwork on lead, except that the dog must be off the lead throughout the test. Dog sitting or in the down position at handler's choice on handler's left hand side. Dog to be recalled by handler when stationary and facing the dog. Dog to return smartly to the handler, sit in front, go to heel - all on command from Judge/ring steward to handler. Distance at Judge's discretion. Test commences when handler leaves dog. Throughout this test the handler may not touch the dog. Handlers may talk and encourage their dogs throughout this test. At the start of this exercise the dog should be sitting at the handler's left side. On command the handler must throw the article in the direction indicated. The dog should remain at the sitting position until the handler is ordered to send the dog to retrieve the article, return at a smart pace, sit in front of handler. On command the handler should take the article from the dog. On command the handler should send the dog to heel. Throughout this test the handler may not touch the dog. Handlers may talk and encourage their dogs throughout this test. The judge will direct handlers to positions in the ring. The command "Last Command" will be given when all are ready and handlers should then instantly give their final command to the dogs. Any further commands or signals to the dogs after this "Last Command" will be penalised. Handlers will then be instructed to leave their dogs and walk to positions indicated until ordered to return to them. 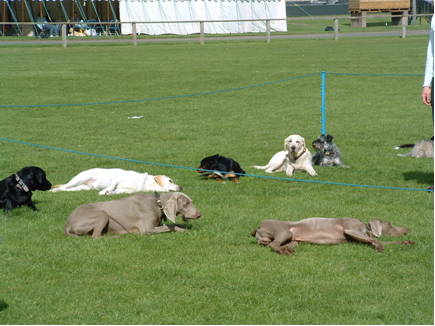 Dogs should remain at the SIT/DOWN positions throughout the tests. This is a Group Test and all dogs will compete together. Handlers must face dogs in stays.